Seminal Irish rockers Black 47 celebrate a Bittersweet Sixteen March 21, 2006 on Gadfly. The disc is a 16-track retrospective of Black 47's recording career from early 1990 to the present and contains two new songs, “Southside Chicago Waltz” and “Joe Hill's Last Will.” The band will embark on a U.S. tour beginning February 23 in support of the release. Also featured are live versions of “Big Fellah” and “Bobby Sands MP,” classics of the biographical song form that leader Larry Kirwan has pioneered, now used in hundreds of high school and college political science courses nationally. The centerpiece features a Vietnam/Iraq War trilogy, “My Love is in New York”/”Downtown Baghdad Blues”/”Southside Chicago Waltz” dedicated to the band's many fans serving in Iraq and Afghanistan while also highlighting Black 47's ongoing resistance to the Bush Administration's foreign and domestic policies. Bittersweet Sixteen is capped by six songs from the band's no-longer-available major label albums. These were culled from a fabled, long lost live studio recording of the K-Rock's Vin Scelsa Show much bootlegged over the years, but now re-mastered and restored to pristine condition. 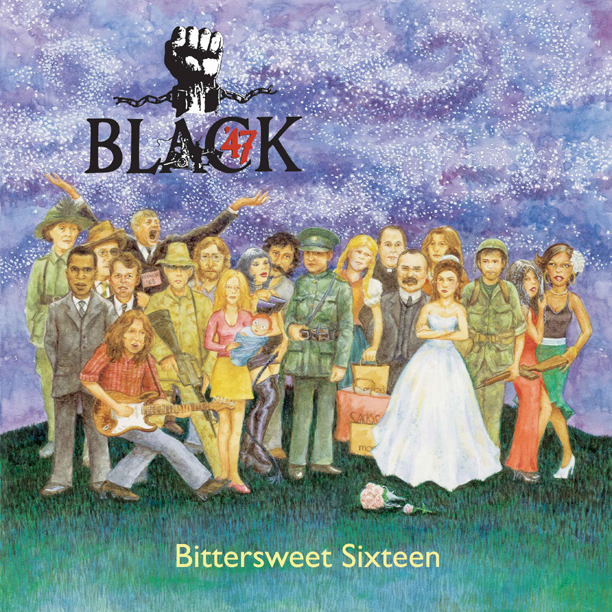 Bittersweet Sixteen , with a song for every year of their career, is an excellent introduction for the newcomer but also a must-have for the avid Black 47 fan who has appreciated the band's distinct originality and uncompromising political stance down through the last sixteen years. Led by Larry Kirwan (guitar/vocals), Black 47 is recognized as the premier Irish-American rock group who paved the way for the current Irish punk/roots explosion led by such bands as Flogging Molly and The Dropkick Murphys. Kirwan programs Celtic Music for SIRIUS Satellite Radio and hosts his own show, “Celtic Crush,” twice weekly. His plays have been performed both in the US and Europe and are collectively published under the title Mad Angels. Both his novel, “Liverpool Fantasy,” an alternate history of the Beatles, and a memoir, “Green Suede Shoes,” have received strong sales and much critical acclaim. Black 47 plays over a hundred gigs a year in North & South America and Europe . Their winter Saturday night NYC shows have been described by as “a rite of passage for all New Yorkers.” Having once closed down the town of Hoboken , Black 47 shows are legendary and incendiary.